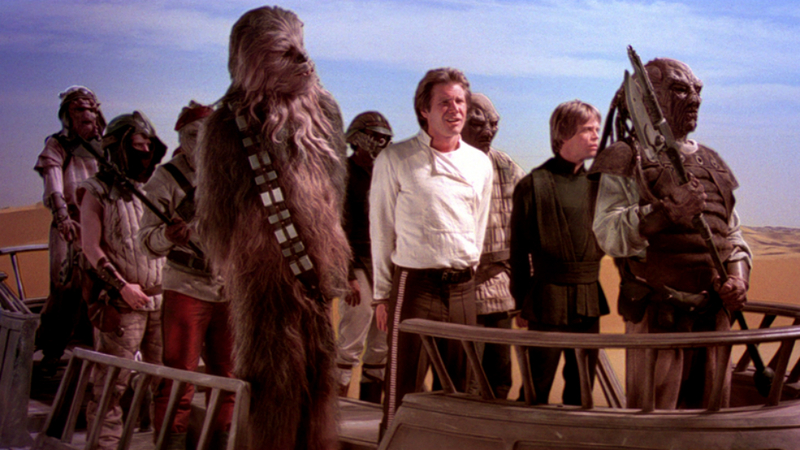 ‘Return of the Jedi’ proves a series’ third chapter can easily be its most meaningful. Star Wars is a series that evolved over the course of the original trilogy, growing with each film to accommodate its metamorphosis from independent passion project to blockbuster franchise. 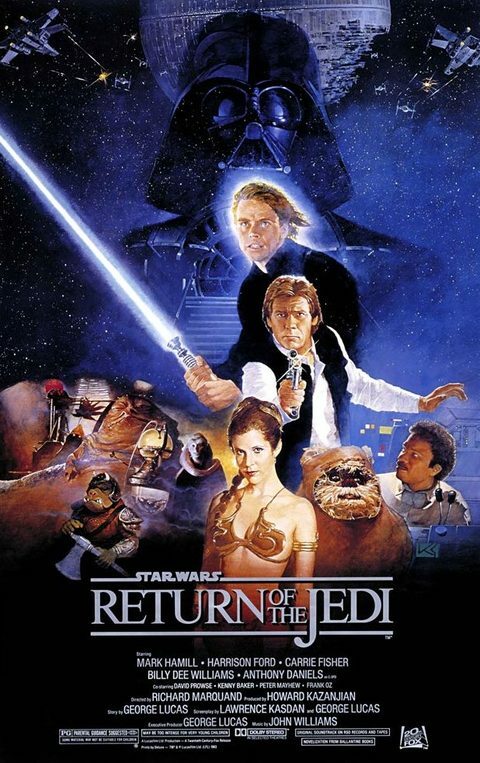 It’s usually The Empire Strikes Back that’s regarded as the best in the series, but it may in fact be Return of the Jedi that serves as the series’ most impressive example of how it adapted to becoming a cultural touchstone, while still preserving the sense of style and adventure that made it a joy in the first place. Whereas Empire went dark and took its cast to new locales and situations, Jedi had the unenviable task of not only following up on the events of that film, but also ending an incredibly popular story that begun in 1977 and serving as a satisfying film in its own right. And from the first scene in Jabba’s palace, Jedi shows it means business, offering all the scum and villainy audiences could handle as Luke and Leia went on a daring crusade to rescue Han Solo. But where Empire went dark with its themes and tone, Jedi went lighter, returning to the style of the first film with a swashbuckling sense of style and a general optimism that oozes through the entire film. Luke may not be a Jedi yet, but he carries himself with the assured gravitas of one, and even when confronted with seemingly unwinnable scenarios, refuses to compromise his principles. From those opening moments on Tatooine to his final showdown with Vader and then the Emperor, Luke’s story maintains the same optimism and faith in humanity that made him such a likeable lead in the first two films. But Jedi doesn’t just nail the main plot, it also dives more into the relationship between Han and Leia, and even manages to redeem one Lando Calrissian in the process. The three are working towards a shared goal, and with their personal hang ups behind them, they can continue forward and become better people in the process. And that’s of course not to mention the film’s tight action scenes, from the speeder chases on Endor or a Death Star battle that nearly rivals the first iconic sequence. And of course, there’s the Ewoks. The furry little warriors of Endor speak to the mix of humor and heart Star Wars has maintained from the very beginning. Perhaps the best thing The Force Awakens can learn from Return of the Jedi is that you don’t need to be completely dark or completely lighthearted to make a great Star Wars film. Jedi, of all three films, had the most to prove. By incorporating the emotional journey of Luke Skywalker along with more lighthearted elements like Ewoks, it was able to keep the sense of adventure alive while keeping the stakes high and giving closure to the galaxy far, far away. It’s that balance between light and dark, much like the battle between Jedi and Sith, that makes Star Wars so entertaining to so many people. The Force Awakens is hitting theaters in less than a month, so stick with us as we journey ever closer to a galaxy far, far away with our post on The Phantom Menace next week. Until then, may the force be with you. What part of the trilogy is best? Do Ewoks cure loneliness? Tweet me @MaxMielecki. Also, be sure to follow us @YouNerded.